Lucky us - as Southern California locals, getting to San Diego is pretty easy. 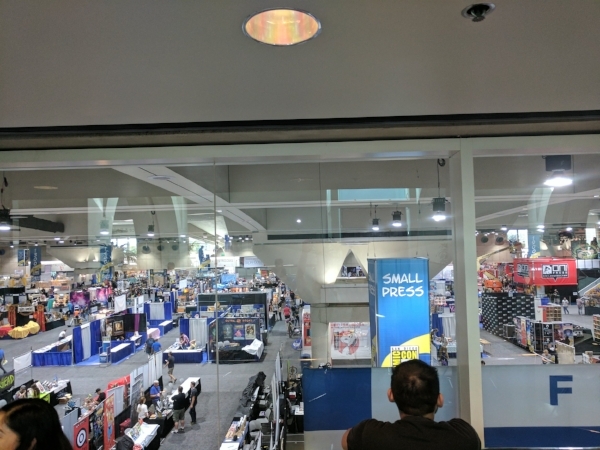 We arrived around 3:00 on Wednesday afternoon, met some friends for lunch at a place called Werewolf (good food, but 99% less werewolf paraphernalia than I had expected), and then headed over to the convention center to pick up our first bit of swag. Despite the intense amount of humanity all gathered in one place, getting through these first steps was surprisingly well-organized! The bag you receive upon presenting your badge (which gets scanned to prevent scamming) is part of the actual swag, along with a collectible pin and a souvenir book. There are many designs on one side of the bag from different con sponsors, but you don't know which design you receive until you're out of the line. That makes them tradeable, which was an unexpected new economy for a first-timer like me. A 10 for fashion; a 2 for loud crinkling sounds. When 6:00 came, the mad-dash began. The tranquil exhibit hall exploded with the fury of a hundred-thousand collectors, and Personal Space became a legend from a long-forgotten past. We bid our friends adieu and headed to the Factory Entertainment booth first. These wonderful people sponsored a hefty chunk of the prizes for our Episode 100 Extravaganza, and we wanted to get to know them better. We spoke with founder Jordan Schwartz and marketing wizard Tom Vargas, and they couldn't have been nicer. It also turned out that they weren't just businessmen, but also hugely into the same nerdy pop-culture as the rest of us SDCC attendees! We had a great time talking with them about the merchandise they make - especially for Game of Thrones - as well as Game of Thrones itself. From badass to adorable, they make it all! Hint: It rhymes with "Crustus Breeg." 25% of the proceeds go to the ACLU! After a short while, we decided to call it a night, finally check into our hotel, and get a little sleep. We knew that the coming days would offer far less of such luxuries!